Step 1. Preheat oven to 200°C (180°C fan-forced) and grease and flour a 20cm x 30 cm baking dish. Using a mixer, prepare the cake mix with the eggs, milk and butter according to the directions. Pour into the baking dish and bake for 50 minutes. Remove from oven. Step 2. 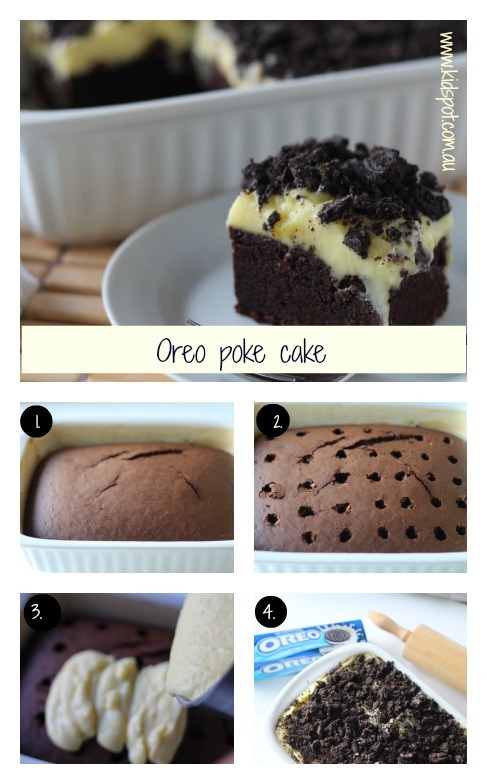 Poke holes all over the surface of the cake using the handle of a wooden spoon. Step 3. Prepare the pudding as per the packet directions but using using 5 1/2 cups of milk instead. Pour the pudding mixture into the holes in the cake and over the top of the cake. Step 4. Sprinkle crushed Oreos over the top of the pudding mixture and refrigerate for 2 hours. I put the Oreo's into a resealable bag to crush them. It makes less mess. The brand of pudding mix in this recipe was Cottee's. Don't be concerned if the mixture is quite thin to begin with because it needs to be poured into the holes in the cake. This recipe was created by Jennifer Cheung for Kidspot,New Zealand's best recipe finder.